At least, I thought I lost the wallet. I really didn’t. It was in the couch, where they always are. But I didn’t find it until after I had cancelled every credit card and been the recipient of a fair amount of spousal criticism — enough to make me reconsider whether or not I really needed a wallet anymore in the first place. The next day, I bought a new iPhone case – a Twelve South BookBook for iPhone 5/5s – that could serve as both an iPhone cover and a wallet. Never again would my wallet and my phone be in two separate locations. Finding a lost wallet would be as easy as pinging my phone. But cases like that are huge. They made the svelte iPhone seem like an ungainly no-name Android knock-off. Or worse, a feature phone. In other words: I had a Costanza again. 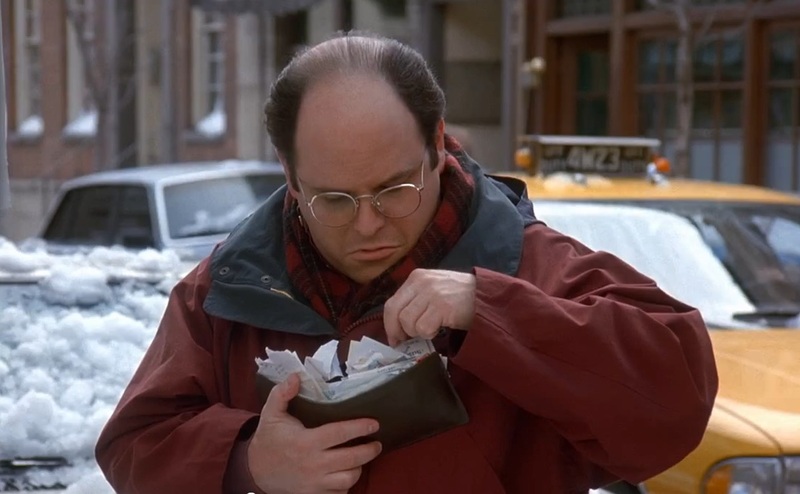 Ordering an iPhone 6 gave me a chance to rethink my wallet/phone case dynamic. 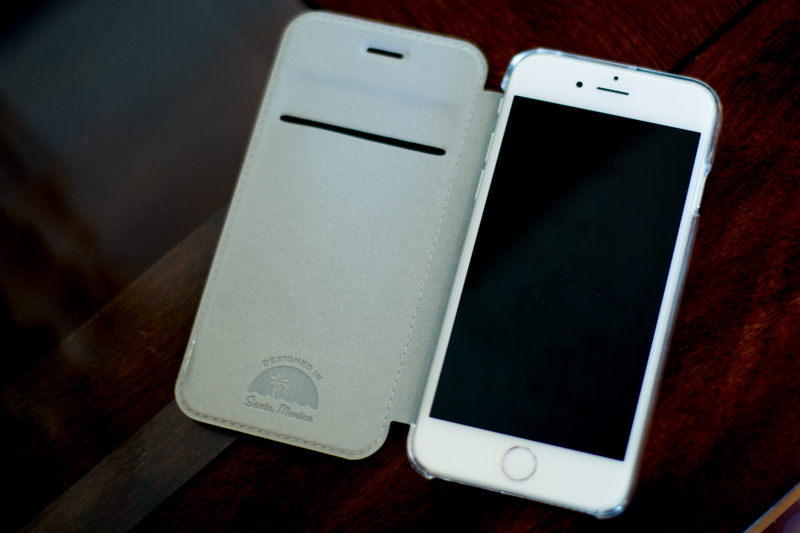 The Twelve South BookBook made the iPhone 5 bulkier, but it was still easily pocketable. Because the phone 6 is bigger, though, the addition of a wallet-like case didn’t seem like an option anymore. Then I saw this piece on TUAW, an excellent Mac-centric website. A company called X-Doria had sent them a bunch of iPhone 6 and 6 Plus cases to review before the iPhone 6 officially came out — a risky move if X-Doria didn’t get the details right, since the cases were presumably produced based on rumored and leaked specs. One of the cases I saw well-reviewed was a tempting folio-style case with a cover and a single slot for a license/credit card. It’s called the Engage Folio and it comes in three colors (cream white, black, and red), and it appeared to respect both the ultra-slim profile of iPhone 6 while still offering a place to hold a card or two. I was hesitant to order an iPhone case without trying it out first, especially one potentially built on bad info, but TUAW was confident enough in their positive review they even orchestrated a contest to give away a few cases to their readers. Also, the price was right. At $30, it was cheaper than similar cases you’d find at the Apple Store. The leather-like cover. It also comes in black and red. First, I waited to see if I won the giveaway contest… which I didn’t. So I broke one of my cardinal rules of web shopping: I paid for an iPhone case before ever touching it. Thanks to the fact that the company is based in Southern California (the label proudly declares it “designed in Santa Monica”) the case didn’t have far to travel, arriving the day before my iPhone did, actually. My first thought: It felt a little cheap and flimsy. Now, just about any phone case without a phone in it will feel flimsy, so I decided to withhold real judgment until later. My second thought, with the iPhone 6 firmly encased in it: It still feels a bit cheap. But in a not-terrible way. The clear polycarbonate backing really does preserve the slim profile of the phone while also allowing Apple’s design details to be seen. The leather-ish cover feels like it might easily rip-off, but so far that fear is unfounded. Overall, it feels quite good in my not-giant hands. 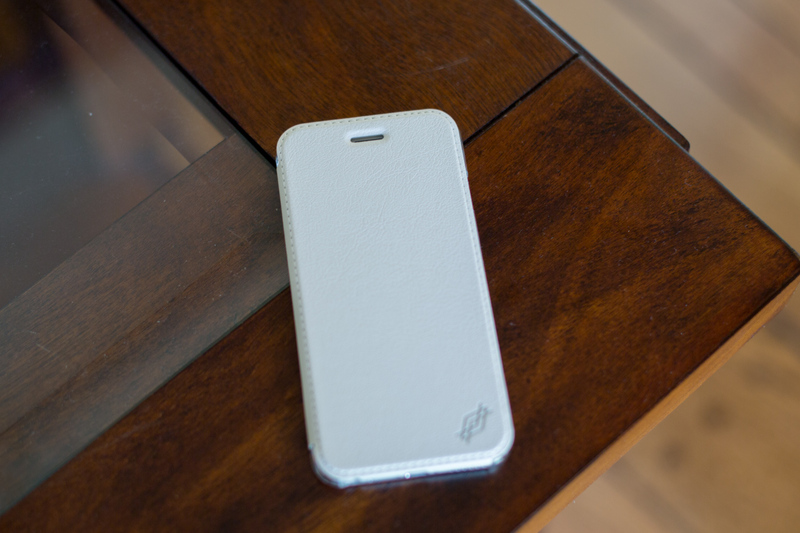 If $30 is a mid-range price for an iPhone case, then this definitely feels like a mid-range product. And that’s okay. It adds very little to the overall size of the iPhone 6. So, will I be returning it? Well, there’s a lot to like about the Engage Folio — the price, the design, the form factor — but as long as I feel the need to carry around at least one credit card (which will be for a while, even in the Apple Pay era), it’s not my ideal wallet replacement. That said, the case is so slim, I can easily fit it in the same pocket as my current, non-Costanza wallet… So for now, it’s a keeper. 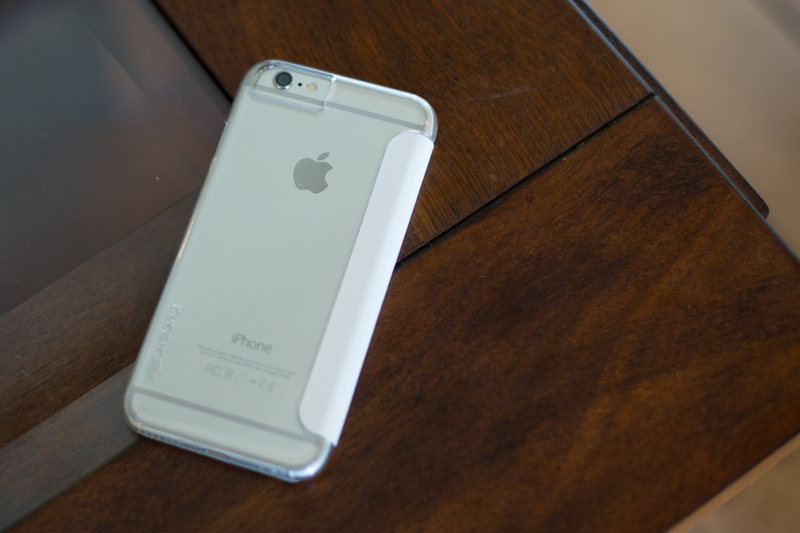 Thank you for this article which is very helpful as I am interested in buying this case for my iPhone 6 Plus. One question I have is that is there any chance that the phone will be scratched by putting it on or taking it off the case as I note that the fitting is tight. Many thanks! I was definitely worried I scratched it when I first put the case on — but when I took the case off to check, it was spotless. My feeling is that you should be okay if you just want a case to put on once, and leave it on for a long, long time. You’ll definitely want to give both the case and the iPhone a good fingerprint & dust swipe before putting them together. Thanks. I was thinking that with the back being transparent dust will somehow get trapped between the back of the phone and the polycarbonate back of the case so that the phone would probably need to be taken out once in a while for cleaning.